Beautiful nails and marvelous nail paints are always catchy and attention grabbing. This time metal detectornail trend is prevailing everywhere. From fashion weeks and runways to beauty salons and makeup counters, you will find metal detector nail trend. Add metallic detector nail trend in the list of must have things this season. Metallic shiny nail polishes range from bold to subdue. Subdued shades are ideal foroffice going ladies while if you are going for a night partywith friends and family then grab bold metallic shade. Whatever shade of metallic detector nail polish you opt, your nails will look outrageous. Choose glitz and glam shiny nail paint that will instantly grab attention and you will be noticed in crowd. The name metal detector also suggests that metal nail colors can be easily detected everywhere with their shiny glide textured hues. 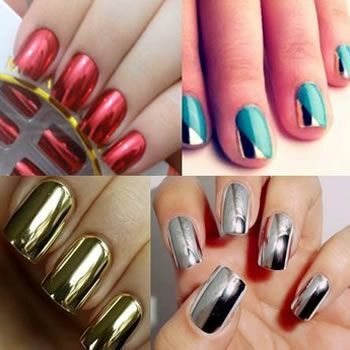 The shades for metal detector nail trend are not just available in classy shades of silver, golden, copper and bronze but go for alternative shades as multiple new shades are available in market. Do remember that glitz and glam of shiny metallic nail paints is not about glittery chunky nails rather it is delicate mirrored texture that you must add in your makeup attire to enhance your beauty of your nails and hands. For all metallic nail paint lovers, here are some most detectable shades of metallic nails paints. Red color is always looks hot. For more playful ladies, metallic red will look really flattering. Allow your nails to indulge in pure shiny texture of red and get bright shiny glamorous nails. From celebrities to models, everyone flaunt and loves this shade. So, why wouldn’t you rock it? If you don’t want to go for brighter shades, then a must have nail paint is bluish purple. Get impactful digits by using bluish purple metallic shade that looks perfect with outfits from plain to glam. Make a fashionable statement and add instant sophisticated touch in your beauty regimen with shinier pale gold hue. Being the classy shade, pale gold hue is still the choice of majority of females. Experiment with metallic texture on your ten digits for modern ultra feel. Cover your nails in bright metallic shiny green shade that will instantly put you in pleasant mood. Simply go with pretty green shade and gets extra indulgence. Make everyone adore your crush worthy digits with bright glam green shade. Let your nails sparkle with sparkle blue shade. For chic ladies, this trend really fits. Women loves to go all matchy matchy. This hue will compliment your blue dress, blue shoes and makeup as well. Why don’t you go for mirror textured navy shade? For gorgeously glided nails, bronze tones are perfect. No metallic is as classy and shiner as bronze is. This classy shade will surely help you to grab attention and make your hands gorgeous with glided classy touch. Go for metallic classy silver nail shade for chrome like effect on your nails. You are going to rock and look gorgeous with outrageous shade of metallic silver. If you love soft hues, go for soft pink shiny nails. For soft hues lovers, the shade of shiny soft pink would be a perfect choice. Try a beautiful mix of delicate soft pink shade with soft shinning that will add glam and glitz in your beauty regimen. Harper Beckham Is Daddy’s Little Girl!